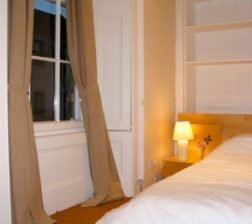 This is a double upper first floor south facing flat and is licensed for occupancy for four people in its four double bedrooms. Its central location means all parts of town are easily accessible on foot. The flat has its own front door at ground level. The entrance is round the back of Argyle Street, in the courtyard area for Argyle Court . Once inside there is a generous sized hallway and the wide staircase then takes you up to the first floor. The rooms at this level have high ceilings. 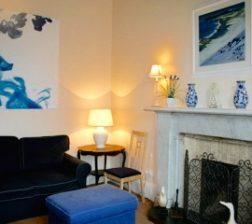 The sitting room and double bedroom no.1 have large south facing windows. 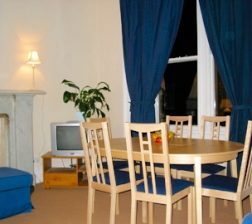 The sitting room has a large sofa and chairs and then a dining table placed in the window area. 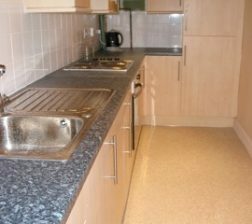 There is a bathroom with toilet and a shower on this level as well as a smaller double bedroom which is north facing. The kitchen is galley style. 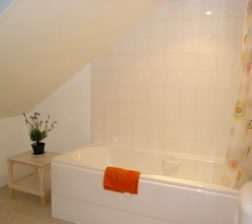 The upper floor has two double bedrooms and a further bathroom with toilet and bath (with hand held shower). 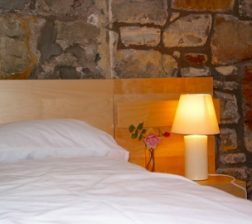 One bedroom is south facing with original beams and an original stone wall and the other one is north facing featuring one original stone wall. Both have velux windows. Parking: There is car park right next to the building towards the West Port but is paying. Alternatively at the entrance to St. Andrews there is a free car park which has a park and ride facility which is only a 10 minute walk away.